On May 4, 1977, a category four (max. wind speeds 207-260 mph) tornado tore through Pleasant Hill, Missouri, injuring five people and causing between $500,000 and $5,000,000 in damages. I remember that day so well. My family had moved into our little white house on Lexington Road just two weeks prior. I was eight years old and in the second grade. My brother would have been six years old and in kindergarten. That day must have really done a number on me mentally and emotionally, as I can honestly say I have no real memories of life before that day. I have seen pictures of my first day of Kindergarten, and first grade, with my little envelope pinned to the front of my dress for whatever teacher I had (that’s the way we did it back then, I guess). Sure I have random glimpses of certain memories, but for the most part early childhood memories seem to be pretty much non existent prior to the day of the tornadoes. It’s a scary enough thing being in a new school, I remember I was in Miss Comstock’s class, and my memories of her are nothing but good, she was the only person I really remember being nice to me and making me feel welcome that year at school. I don’t really remember that morning too well, I remember it had been an unusually warm day, and being on the playground alone during recess, shortly after coming back in to class, I remember looking out the window and noticing all the lights were on outside, and thinking to myself that it looked like night out there, the sky was so black and ominous looking. This was probably about eleven AM, and I think we were doing our reading, but it could have been math, or anything else really. It was just one of those moments where I got distracted by some unknown force that made me look out the window. Never having a memory of or really encountering bad weather, in my innocence, I had no real concept of the severity of the dark skies, or that I should in any way at all be worried. I just remember being amazed that it was dark as a moonless night at such an early hour and wondering why that would be. Soon thereafter, we were all shuffled into the storm shelter in the basement, walking past the windows the skies now held a very eerie greenish hue and all seemed frighteningly still outside. All lined up in the storm shelter, sitting indian style on the floor, I still really had no concept I should be afraid. This was just another new experience for me. New to the school, I really had no idea that this little exercise was something out of the norm. For all I knew this was a monthly thing. I remember other kids around me on that floor being afraid, and teachers singing to try to ease some of the fright. I am not sure how long we sat there. It could have been two minutes or two hours. I still was unafraid, and for the life of me did not understand why so many others were in such a state. Then we were told to put our heads down, and to cover up. I think it was at this point, with our heads down, crouching together on that floor in the storm shelter that I realized I should have some sort of fear. Strangely, I still seemed immune. It was when I heard crying, and my fellow classmates around me sobbing and praying for their families and pets to please be safe, and to not die, that I started to feel an inkling of fear. I remember thinking to myself, I best pray for my family too. I prayed for my brother, and my parents, and our dog, just a simple prayer, “Please God, let them be ok. I don’t know what I would do without them, please don’t let them die”. 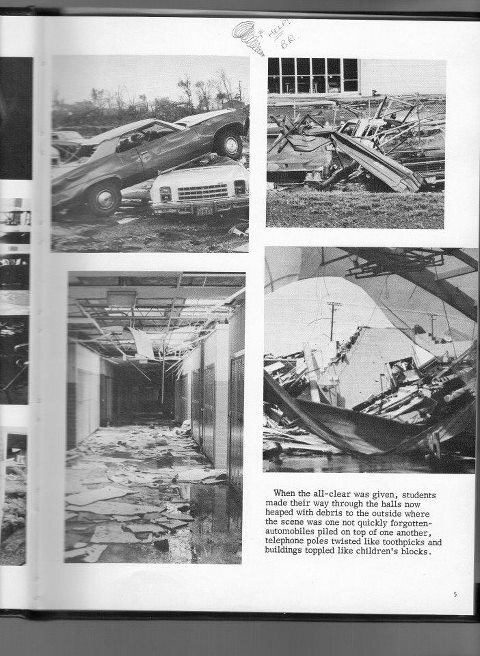 Then the tornado hit the school. Yes, I can tell you that a tornado does in fact sound just like a freight train coming through. Strangely, while I knew I should be fearful, I had yet to really feel it full force. When I heard that sound, I looked up. It was as if everything was in slow motion, everyone, including the teachers had their heads down, sitting indian style in rows on the floor. The air above our heads seemed to me to be almost like a fog, the dust and whatnot were stirred up so much, I have memory of the double doors to the room we were in shaking and rattling and generally making banging noises. The lights began to flicker, then went out, plunging us into darkness. That was when my fear kicked in full force, but only because I am to this day deathly afraid of the pitch black darkness. For a bit things are a blur for me. A lot of fear form those around me, talk of another tornado coming, looking for my brother, in general really not knowing what to think or do, other than obey the teachers, and do as I was told. The next thing I remember was coming up and out of the storm shelter, still now knowing exactly what a tornado was, or how extremely devastating it could be. I remember walking past the kindergarten classroom and seeing that all the glass was broken out and gone, wondering where my brother was. The skies were once again bright, rain was pouring in on us through the roof, and there were ceiling tiles haphazardly hanging down in random places. I couldn’t find my brother, and we were loaded on buses to over full capacity and transported to the First Baptist Church. Upon arrival at the church I remember water standing on the floor. I didn’t understand this at the time, as the church had not been hit. I now know it was water dripping off all the students clothes from the soaking rain. It seemed I waited for hours for my mother to come, I still never found my brother. All the other kids parents were picking them up, everyone seemed in a combined state of fear, anxiety, worry, and eventually relief when they were reunited with their loved ones. I am not really sure how long I was there at the church, but it was there that I fully understood the reason to fear tornadoes. I was waiting and waiting for my mother, and watching and watching. Despite my searching, I still had not found my little brother. I began to fear that they were no longer with us, that I might never see them again. Finally I was taken home by one of our neighbors who lived across the street from us. I do remember the feeling of almost shock that I felt upon exiting the church, the sun was shining, and the skies were blue, it was as though this horrific weather event had not occurred at all. To this day I honestly can’t remember being reunited with my momma. I later learned that she and my grandmother had gone out of town to do a little shopping and while on their way back home my mother noticed the grass laying flat on the ground all along the roadway. She mentioned to my grandmother that the only time she had seen that happen was after a tornado. Upon arrival at the outskirts of town, they were stopped by the highway patrol, who had the entire road blocked, and were not going to let her in, as she did not have a city sticker on her car yet. I can only imagine the frantic explaining we had just moved there, and had not had a chance to get the city stickers yet. Eventually of course, I guess her panicked explanation in combination with the tears, and a mother’s urgency to find her children finally got her through the check point. She went to the church and found my brother, who despite all my searching I could not find. And upon arrival at the house, found me safe and sound across the road. That day ended the school year, and I remember being happy to have summer break start early. In the days, weeks and months afterward, I remember stories of such strangeness I could not even imagine. One of someone who had gone to the school to clean up and finding one of the rooms that seemed completely untouched, the books on the desks turned to the page the students were studying at the time of evacuation. One of the tornado itself having three tails and the kids in the high school essentially “dodging” it as it went through. That the kids in the shop room at the high school had not heard the sirens with all the equipment running, and just made it out in the nick of time. A car being deposited on the roof of the high school, and seeing a piece of twine embedded a good ten inches deep in a very old oak tree. The story of a house on Country Club who’s roof had been lifted off and the curtains were hanging on the outside and the roof sat back down. There was also a house who’s owner had a vine plant hanging in her kitchen who’s final resting place was between the roof and the wall on the outside. That day began my extreme fear of severe weather. While I did not feel it at the time, the aftermath clearly opened my eyes to exactly how devastating such weather can be. It does not discriminate, and can totally destroy an entire home and leave a simple single item standing as if untouched. I was there that day as well. I was in 3rd grade. Miss Comstock had been my teacher the year before. Your memories coincide with my own. I’m glad you mentioned the singing in the school basement. When the teacher (I think she was a 1st grade teacher) started playing her guitar, I knew it was the real deal & not our regular drill. Yesterday with all the weather here in Oklahoma I was a mess. My heart broke for those children in Moore. I do not understand why all schools are not more secure for the children of our future. The school we were at in PHill was brand new. It opened the year before you moved there & had been built with a state-of-the-art tornado shelter. The school we were previously in had no shelter. We drilled filing out to the hallways & sitting against the walls with textbooks over our heads. I heard that several of the children in Moore drowned in the building. That was my greatest fear sitting in the basement of the school in 1977. I remember sitting there with the water rising around us. I was more afraid of drowning than being sucked out of the building by the winds. People keep saying things like, “I can’t imagine how terrified those children must have been.” I guess you & I know exactly how terrified they were. I don’t even remember ever going through a drill, don’t think I was there long enough. I really didn’t know what was going on, but I did know the other kids knew what to do, so I tried to act like I did to. I had no clue. I don’t think I even knew what exactly a tornado was, or how devastating it could be. My fear to this day is palpable. I find myself on the verge of tears trying to control the deep seated fear that ominous weather brings upon me. I try to put on my brave face, and hide it, but most of the time I fail miserably, especially with those who know me best. I remember the rising waters, but again, do not remember that that should scare me. I guess I was always made to feel so safe in my home life, that I never thought about anything bad happening to me. Well, until that day. I know exactly how those children in Moore felt, and that is what makes it all so much harder for me to bear. I understand completely. I must have been in your brother’s Kindergarten class. I remember so much of what you wrote about, and it was heartbreaking to read last night about more schools being hit. Very few have really understood the fear I have had all these years or what I experienced back then. I remember thinking when we lined up to go to the shelter (seeing how dark it was outside and that it was the real deal) that it was a good thing that we had at least practiced the tornado drill one time before. I also looked at the glass wall of our classroom coming out and knew what would have happened if we hadn’t been in the shelter. Only someone who has gone through it can fully understand, I believe. Seeing it from a distance, or watching a video on television, or seeing footage of the aftermath makes people shake their heads and say the normal things people say in those situations. While we were truly blessed in many ways, and made it out safe, the fear seems to never stop. When you think you have it under control, it rears its ugly head yet again. I remember those same things too. I remember what i wore that day, a yellow skort. I carried my denim purse, that my mom later found in the school under debris.. My cinnamon lip gloss was unbroken. I recall sitting by Wayne Farrell in my classroom, we were looking outside. It was so dark, it looked like night time, but with an added greenish hue to the sky. Wayne said, “This is what it looks like before a tornado.” It was completely still, no wind. The teachers announced that we needed to move to the storm shelter, it was done in a calm and orderly fashion. I never felt fearful. I felt we were in a safe place, thank God for the basement. The teachers had a lot to do with keeping us calm, Mrs Hayden played her guitar and we all sang. I don’t remember the noise of a freight train, as much as I remember the double door shaking and dirt/dust coming into the basement. After it was over, i remember the teachers going up stairs to assess the damage….. I remember once we emerged from the basement that the rain was coming down harder than i had ever felt. I remember the bus being so full that I was sitting on 2 people. I remember seeing the power lines down. And yes.. The Baptist Church had several inches of water in the basement from all the clothes that were dripping… What memories. I taught Remedial Math at the Primary school and remember that day well. We had practiced tornado drills so many times with a stopwatch wielded by Principal Ruby Perlinfine that we were able to clear the building into the shelter in one minute. It is my understanding that we only had gotten a two minute warning before it hit. I’m so glad that you kids remember the guitar. The irony was that the song she played was “You Are My Sunshine!” It was a complete miracle that no students were hurt either in the High School or the Primary School. I lived in Lee’s Summit, or rather east of L.S. almost to 7 highway, and remember watching this tornado from my basement window from maybe 3-5 mi away. I remember the sky was very green and the tornado just looked like a dark mass of flying dirt. Couldn’t see the actual tornado but could see things going up in the air around it. Ironically was also 8 yrs old, same as the author here, but went to Greenwood Elementary at the time. Thank you for your perspective on that day in PH. I was there as well http://groucho-karl-marx.blogspot.com/2007/05/may-4-1977-day-of-twisters.html . My introduction to tornadoes was a bit younger than you were at the time of the PH twister: 4-1/2-years-old and Ruskin Heights- May 20, 1957. In fact lanailens- a small tornado did hit a small part of Ruskin Heights about 10 hours after Pleasant Hill was struck that day. I was there as well…first grade also. It was the day before my 7th birthday. I remember the fear of drowning but more than that, I remember the fear of being pulled out those double doors. The sound of them banging when the tornado hit haunts me to this day. I was in morning kindergarten. So I was at a babysitter’s house. We were right behind what is now Savelot. We were fairly new in town so my parents had trouble getting in town do to not having a city sticker. I remember it was loud and dark. I absolutely remember that day! It still haunts me! The teacher playing the guitar is my mom and can remember the roar and the pressure on my ears! I’m still skittish today! I now live just north of Joplin No.and the tornado that tore right through the heart of town brought all those memories from P hill! I was over the hill in the high school, a junior and got to hide in the storage room of the kitchen… Our experience was about the same… And today the weather is just strange enough to send my brain back there…. I still get goose bumps from even thinking about it… Thanks for sharing! I was a teenager when this happened. I had spent the weekend before at the Bowens. Bud Bowen. A railroad tie was through the living room. The house next door destroyed and so on. Thank you for the nice story. I was in Mrs. Adams 3rd grade class that day. Your description is exactly how i remember it. I also remember the doors to the outside of the basement and teachers trying to hold them closed. I was there that day as well. I was in 2nd grade. I can’t remember my teachers name though. My house was one of them on Delaware St. That was destroyed. We lost everything. I would like to be in touch with any of you that have memories and or photos of that day. That day I was nine years old and in the fourth grade. I was huddled in the old primary school praying that all my family was ok. We lived on Delaware and my mom was in the basement. She was unhurt. After we three returned home, our three dogs came walking to us. They were sore and filthy, but ok. We ended up moving to Lees’ Summit. Till this day, I want to move back home. And to this day, I still have storms.